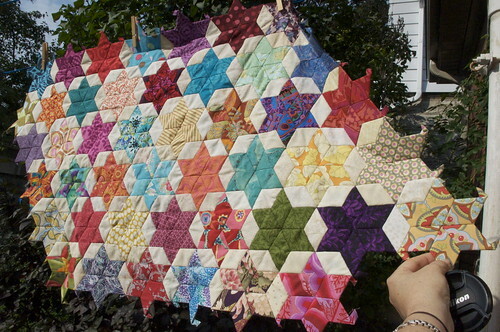 In the summer of 2010 (if I recall correctly), I was looking for a hand piecing project. I had never done any significant hand sewing but I wanted something I could work on while watching television in the evenings. 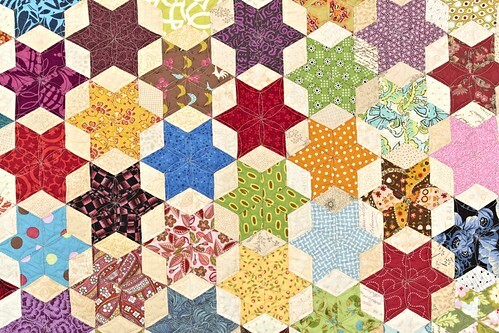 Jessica suggested I try English paper piecing, and on her blog I saw some of her spectacular quilts made with this technique. I decided to try it - I was particularly happy with the way it could use up some of my tiniest scraps. Here's what I produced the first month. 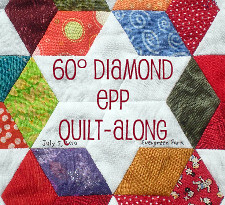 Several people have said that EPP is addictive. It certainly was in my case! I was surprised at how quickly the little stars went together. I assembled them the way Jessica showed in a little video that was on her blog, and like her, I used the plastic Quilt Patis templates. 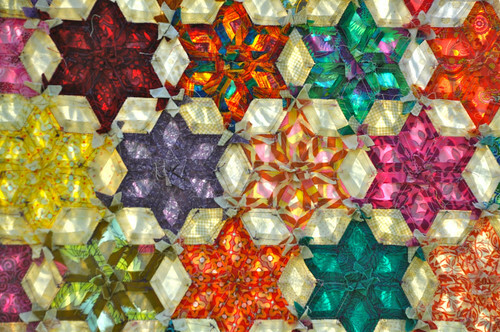 I made every star out of the same print, but used many different light diamonds for the background. I really like how I was able to use some of the oldest fabrics from the early '90s in my stash. 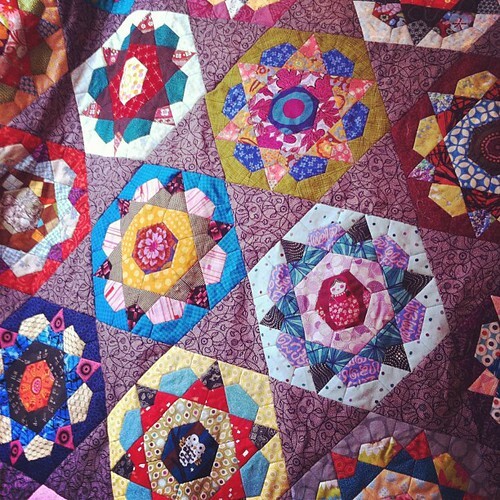 Here are a few progress shots over the course of the 14 months it took me to make the quilt. 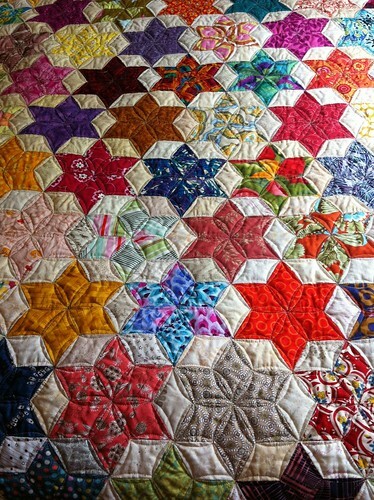 A couple of the photos of the completed quilt top have been widely Pinned; if only they could see it now! 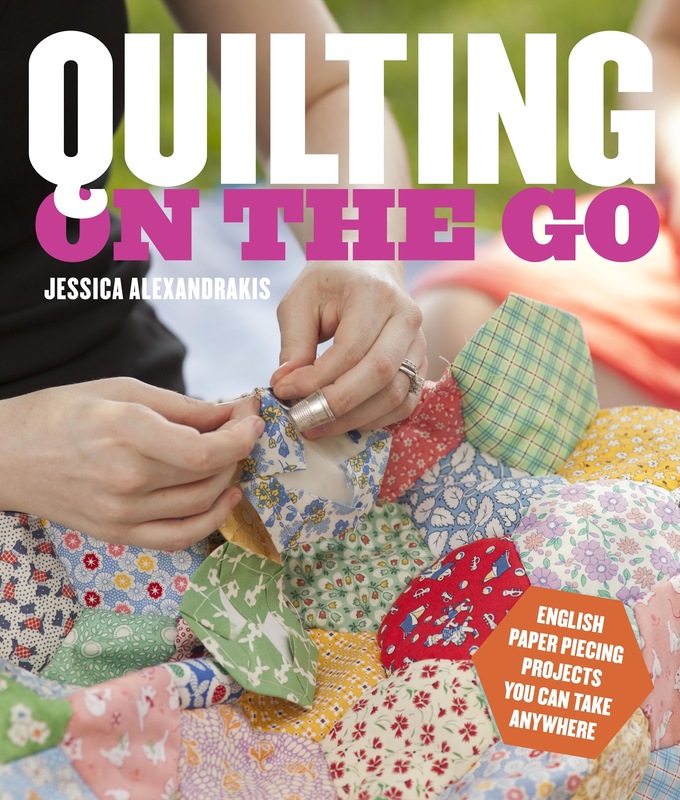 Jessica is such an EPP maven who has made so many beautiful quilts that it's no surprise that she was asked to write a book on EPP for Quarto Press. 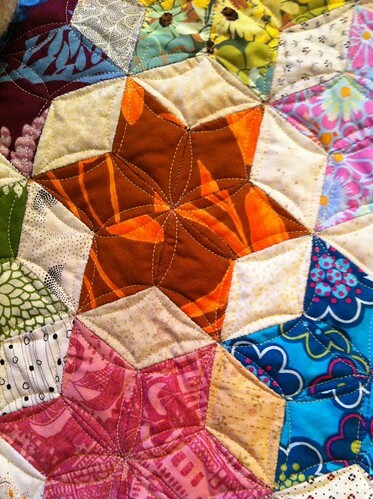 What was a surprise was that she asked me to share my quilt in the book, as well. 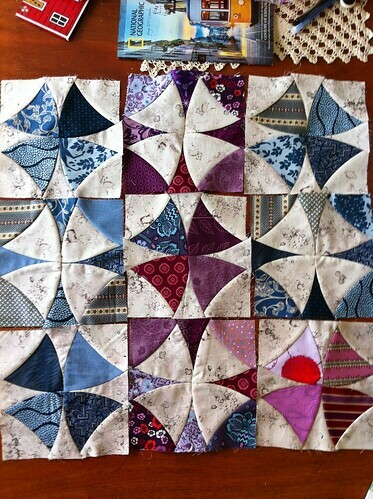 After I finished piecing the top, it had been sitting around for several months. This gave me the impetus to get it finally sewn up. 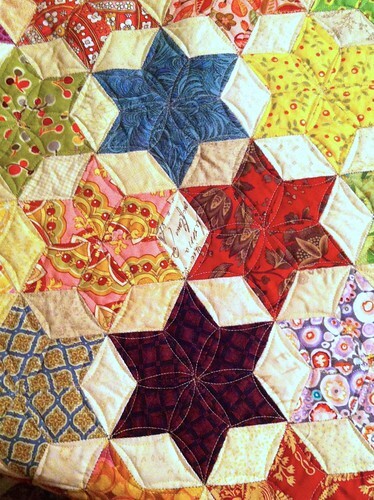 This was also the first quilt I had professionally quilted; it was done by the so-talented Shannon Baker. When it came home, I nearly fell over. I couldn't stop touching it! I took some photos, but I knew it had to keep a low profile. I do get annoyed when people say "I've been working on something top secret that I can't tell you about". I put one picture up on Flickr but didn't say much about it. 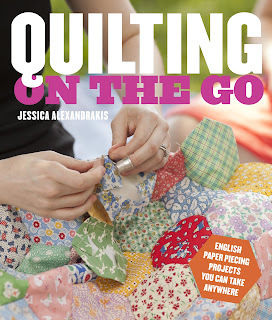 Jess has made the announcement about the book so I can now show off my quilt! I admit it's been hard to keep quiet about it! These are some of my photos. 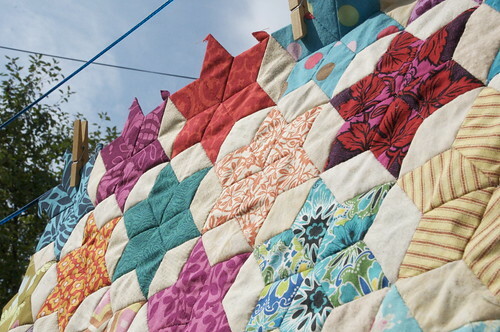 It was agonizing to send the quilt off to London to be photographed for the book! So far away and so many possibilities for going astray! They kept it for ages, but when they sent it back, they included some high res photos on a CD for me. I had made a little label using the alphabet letters on my machine, and they seemed to like this a lot. There must have been six or seven shots of the label alone. It wasn't even well done - my machine didn't seem to like the word "Ontario". Never mind. 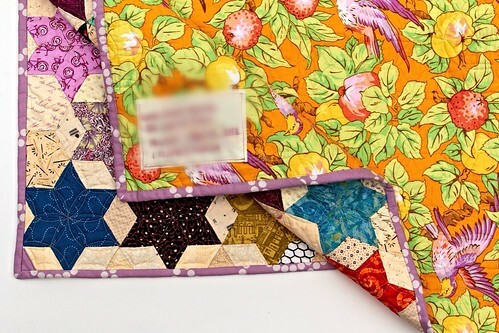 I'm including it here so you can see the Kaffe Fassett fabric I chose for the back. These are the photos taken by Quarto's photographer (I'm sorry, I don't know his or her name); the photo at the top of the post is theirs, too. Edited to add: Sharp-eyed Jess noticed this little purple bit on the lower left corner in the photo above and wondered about it. 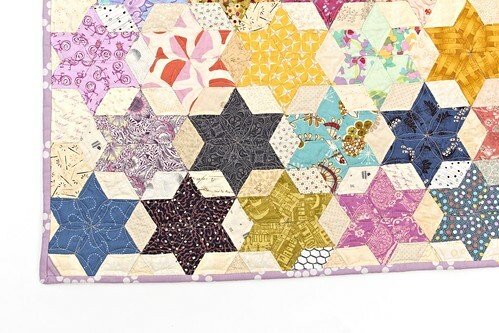 When I was straightening up the edges before binding the quilt, the edges on the left and right had to be trimmed (e.g., whole hexagons cut in half), but the top and bottom had a more or less straight edge right from the paper piecing. However, I had forgotten to add the last little light triangle on that side, so I just used some of the binding fabric to cover the bit of batting that was peeking through. 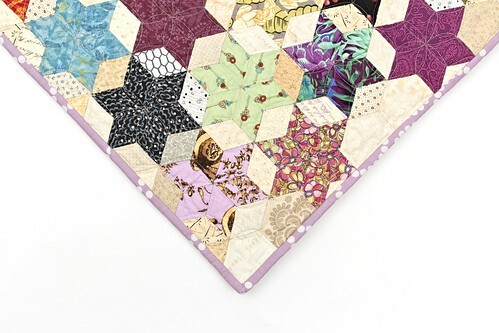 If you want to learn EPP and how to make a quilt like this and many other things using this portable and addictive technique, be on the lookout for Jess's book Quilting on the Go. Published by Potter Craft, it will be available in June (if you are in the UK/Europe, look for it earlier and published by Search Press)! 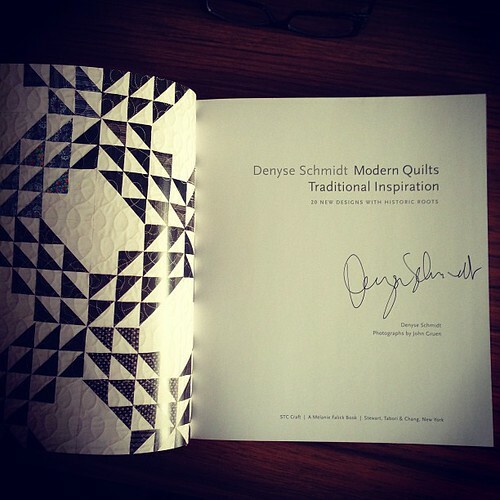 Just received this wonderful book as a giveaway prize by Krista at Poppyprint. It's a knockout! And look! It's autographed! 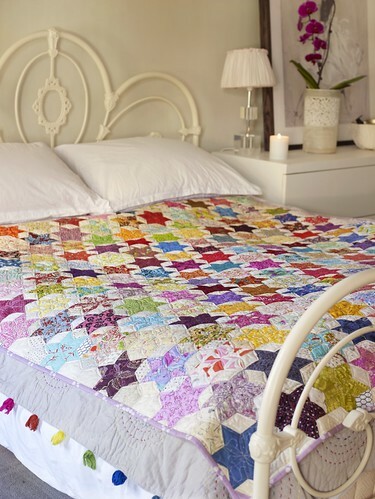 I want to make just about every quilt in here. Thanks, Krista! What about Google Reader, eh? Like many of you, I was gobsmacked to hear it was going to disappear. It seems like many people are moving over to Bloglovin', so I've added a button the the sidebar of my blog. I have a lot of chutzpah, jumping on the Bloglovin' bandwagon, since I've not had a blog post this long age. 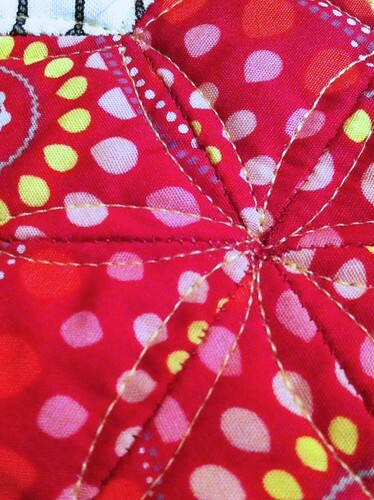 I've been trying to limit my sewing in order to accomplish some of the necessary things to do with Real Job. I feel guilty if I give into my "want tos" at the expense of my "need tos" too often. I've not been totally idle, though. 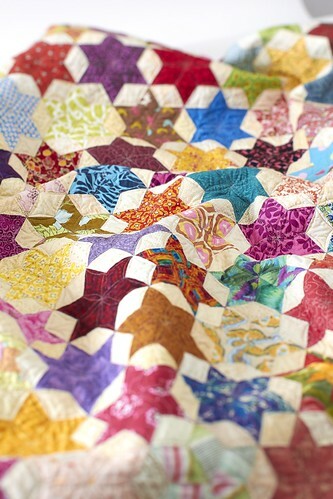 I cut a big whack of purple and blue FQs, and this fantastic Inkwell background, to make a Winding Ways quilt. 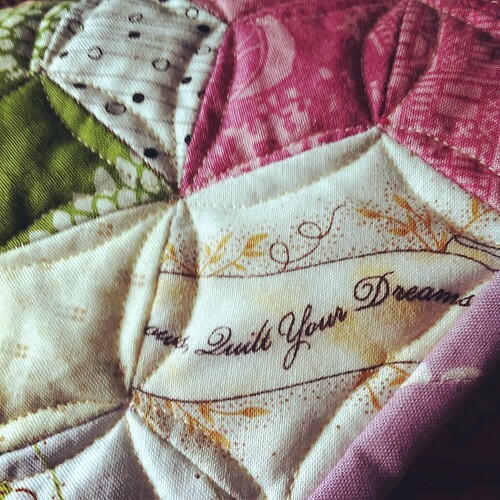 I used the Accuquilt die on my Sizzix BigShot Pro. 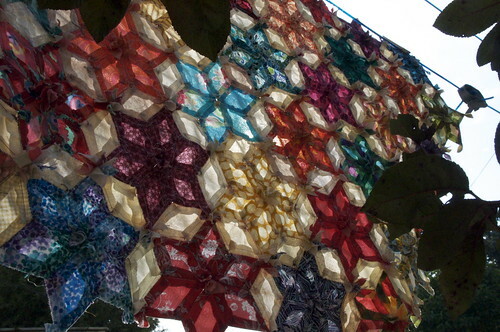 I sewed a few blocks together just to get a look at how they are going to shape up. I think I'm in love! I started this for someone else, but after I had everything cut out I found out this person doesn't like purple for home decor. So I will keep it. You mustn't think I planned it that way - sometimes fortune favours us when we are trying to do a good deed for someone else. Never mind, I have started cutting for a different project for the would-be recipient. 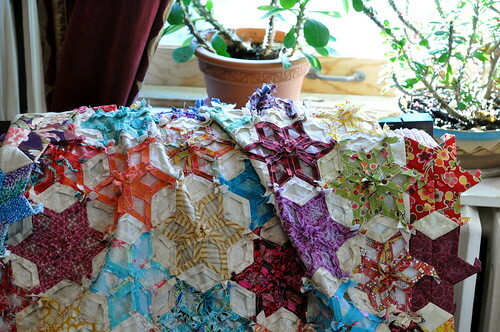 My main activity has been working on this Rose Star EPP project. 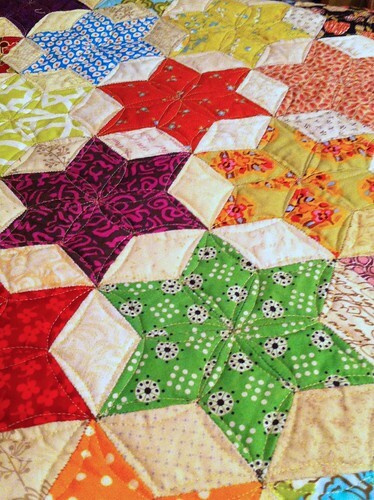 I wasn't sure how many of the star blocks I would need to make to make the quilt a reasonable size. 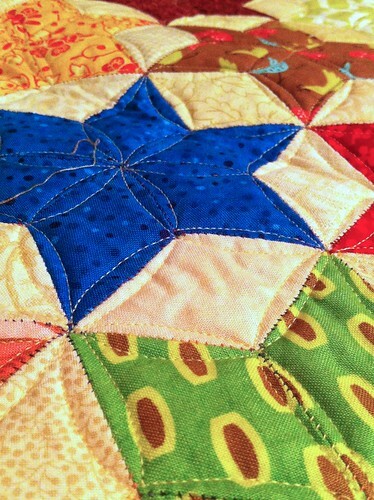 When I got to 31 stars, I began to piece them together, and it looked like I would need another five blocks to make it complete. 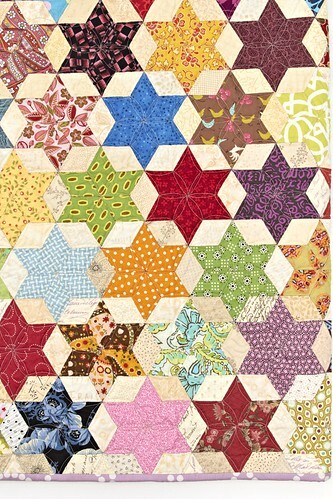 I'm using a print from the Ghastlies line for the 5" equilateral background triangles. 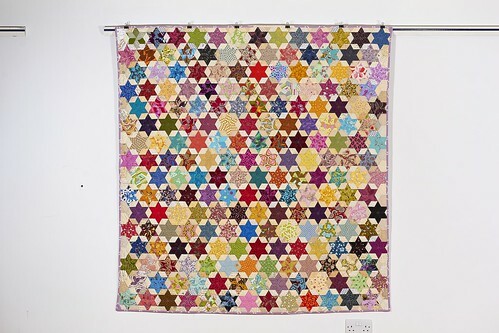 Here's the current status of this project: the 31 stars are pieced together and I have made three of the remaining five stars. So I am really very, very close to the end of this project! 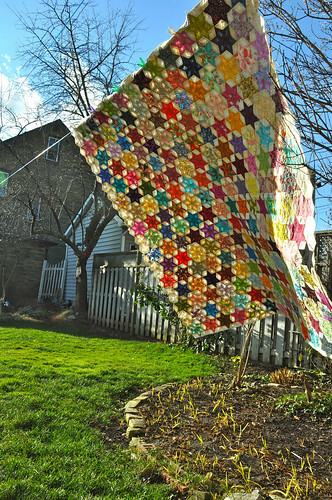 I'll probably sew a border on it in order to even up the edges. It's going to look great, I think. 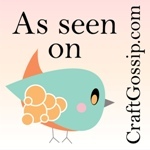 As for my next hand project, I am just about ready to take the plunge into applique. That will be a whole 'nother kettle of fish!